Is Apple about to transform the MacBook with a dual-sided trackpad? Apple moving into transformer territory? MacBooks could soon come packing not just one, but two touchscreens, with Apple having just secured a patent for a "dual-sided trackpad" for use in a future iteration of the laptop. 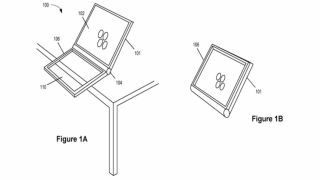 The patent describes a system with a foldable capacitive panel that's capable of sensing touch from both sides. The trackpad could cover the entire bottom part of the MacBook as a regular keyboard does, but you'd still be able to interact with the laptop when the transparent trackpad is closed over the screen. "The track pad device may include a display element and the capacitive array element may be translucent," it states. From what we can see, this will essentially turn the MacBook into a sort of more high powered iPad, letting you access various things when the device is shut. You will, however, be able to switch the bottom panel off when you're not using it, to stop it from gobbling up the battery. The patent was awarded to Apple by the USPTO and, while an interesting concept, it's worth remembering that it doesn't mean Apple is going to act on it any time soon.